Have you ever thought about the general elections of 2014? And if your answer is yes, you might just remember that because of a single person who personified victory to an extent during that period – Narendra Modi. However, do you know what were the reasons behind this massive victory for Modi and his team? What transpired? What changed the momentum of the country’s politics? If you are curious to find answers to all these questions, you need to read a book by Phidalia Toi – The Dawn: Marathon Race to Acche Din. Phidalia has very wonderfully summarised the pre-election period and then the first year of Modi-led NDA government at the centre. She almost recapitulates all the significant moments and events which took place before and just after the elections in 2014. 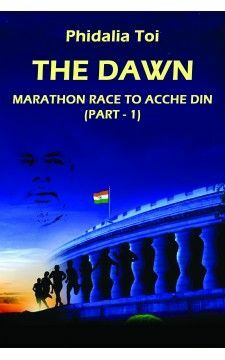 Her book The Dawn: Marathon Race to Acche Din is wonderfully divided into all the ‘must be there’ chapters – important happenings, different fractions of powerful man Modi, the problems ahead and a beautifully composed poem at the end. Not to forget that the book opens with a deeply thought of address (in the form of foreword) by Purno A. Sangma, the former Speaker of Lok Sabha. Sangma puts the torch to the important issues which are further elaborated by the author Phidalia Toi. The fall of the Congress party and the rise of AAP as well as the reawakening of the lotus army… everything is captured in the first part of the book which discusses pre-election period. Phidalia is at her best in the use of her language which firmly suits the discourse of the book. For the assurance of her facts, she has rightly countersigned them with the references to the newspaper articles. The most striking part in the pre-election part of the book is the details of a ‘secular league’. The author has been very factual and to the points in analysing the events. And Phidalia adds her point of observation that Modi’s remark was to silence the critics who claimed that Modi’s escalation to the fore will isolate the BJP. And she is very right in making this as well as many other wonderful observations for the readers who are curious to seriously analyse the elections held in 2014 plus years after that. This book The Dawn is only the first part of the series which will be followed by four more titles. Each title will sum up a year of Modi government at the centre. I will recommend every reader who follows politics a tiny beat to read this wonderful title by Phidalia. Her writing and observation are praiseworthy as well as critically upright. She isn’t jaundiced by any kind of ego, prejudice or ill-thoughts. That’s why she has very well summarised the readers that all the good work done by Modi might well be forgotten by people if he is unable to take control of the fringe elements that create panic and trouble in the country in the name of religion. Everything is good only under a limit. Readers, don’t wait and go for this wonderful title! You won’t be disappointed that I assure you.